... that Mammes of Caesarea is said to have been breast-fed by his father? 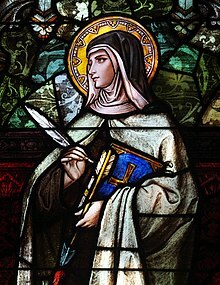 ... that Maria Bertilla Boscardin, who was rejected by one religious order for her slowness, became a nurse and was eventually canonized a saint in the presence of several of her earlier patients? ... that the recently beatified Paul Joseph Nardini died of pulmonary typhus he contracted while giving the last rites to a member of his parish? Saint Augustine of Canterbury (died 26 May 604) was a Benedictine monk who became the first Archbishop of Canterbury in 598. He is considered the "Apostle to the English", and a founder of the English Church. 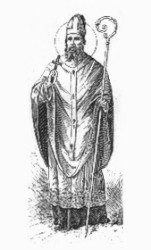 Augustine was the prior of a monastery in Rome when Pope Gregory the Great chose him in 595 to lead a mission to Britain to convert the pagan King Æthelberht of Kent to Christianity. Æthelberht allowed the missionaries to preach freely and converted to Christianity, giving the missionaries land to found a monastery outside the city walls. Augustine was consecrated bishop of the English, and converted many of the king's subjects, including thousands during a mass baptism on Christmas Day in 597. Pope Gregory sent more missionaries in 601, along with encouraging letters and gifts for the churches, although attempts to persuade the native Celtic bishops to submit to Augustine's authority failed. Roman Catholic bishops were established at London and Rochester in 604, and a school was founded to train Anglo-Saxon priests and missionaries. Augustine arranged the consecration of his successor, Laurence of Canterbury. Augustine died in 604 and was soon revered as a saint. The authority of the Roman Catholic Church over the Church of England remained in place for ten centuries, until the latter broke away in the 16th century during the English Reformation.